FILE - A soldier stands guard at the doors of the War Museum visited by foreign reporters during a government-organized tour in Pyongyang, North Korea, Oct. 9, 2015. The mystery and concern surrounding the recent arrest of an American university student visiting North Korea has not stopped tour operators from offering excursions to the repressive and isolated country. Otto Warmbier, a 21-year-old University of Virginia student, has been detained in North Korea since January 2. The arrest occurred at the Pyongyang Airport as the group was preparing to board a North Korean Air Koryo flight bound for Beijing. Tour operators were told at the time that he had been taken to a hospital. 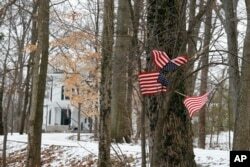 FILE - Small American flags have been placed in the trees in front of the Warmbier family home in Wyoming, Ohio, Jan. 22, 2016. There were reportedly 10 other U.S. citizens on the tour, all of whom were allowed to leave Pyongyang without incident. North Korea's official KCNA news agency provided no details on the arrest other than to say Warmbier "was caught committing a hostile act against the state." Phil Robertson, Human Rights Watch deputy director for Asia, said Pyongyang has a history of abducting foreign nationals for political purposes, and is likely holding Warmbier as a bargaining chip to gain diplomatic leverage with Washington. The U.S. has been pushing for increased international sanctions against the Kim Jong Un government for conducting its fourth nuclear test. “I am really rather amazed that so many Americans continue to feel safe going on these tours. Ultimately, there is very little to protect them against an arbitrary act like this by North Korea,” Robertson said. Young Pioneer Tours declined VOA’s request for an interview, saying it is adhering to the wishes of Warmbier’s family and relevant agencies working to secure his release. 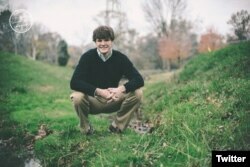 FILE - Otto Warmbier's profile photo on his Twitter page, @ottowarmbier1. Young Pioneer Tours continues to run tours into North Korea. So are other Beijing-based travel agencies. Explore North Korea said Tuesday it is running weekly excursions into North Korea and has never had an incident where one of its clients was arrested. And Koryo Tours is currently advertising on its website a trip to participate in the Pyongyang Marathon in February. A tour leader with Young Pioneer Tours said there was an unspecified incident at the hotel were the group was staying in Pyongyang that prompted Warmbier’s arrest at the airport. Travel writer Becki Enright, who blogs about adventure tours on her website Borders of Adventures, said there are strict rules for the approximately 6,000 Western tourists who visit North Korea annually. Intrigued about seeing a country that has been cut off from the rest of the world, Enright joined a Koryo Tours trip there in 2012. She said the tour leaders provided daily detailed briefings on what visitors can do and how they should act while in North Korea. For example, it is prohibited to photograph construction sites, military installations and even close-ups of statues of the Kim family and other leaders. It was also stressed to avoid getting into any discussions with North Koreans about topics that might be considered political. “Go and open your mind, but it is made very clear that that is not allowed,” Enright said. Warmbier is not believed to have been in possession of any religious or political literature, which factored into the detentions of previous foreign visitors. The U.S. and Canadian governments both advise against travel there. The U.S. State Department has said it was aware of reports that a U.S. citizen had been detained in North Korea, but gave no further details, citing privacy concerns.